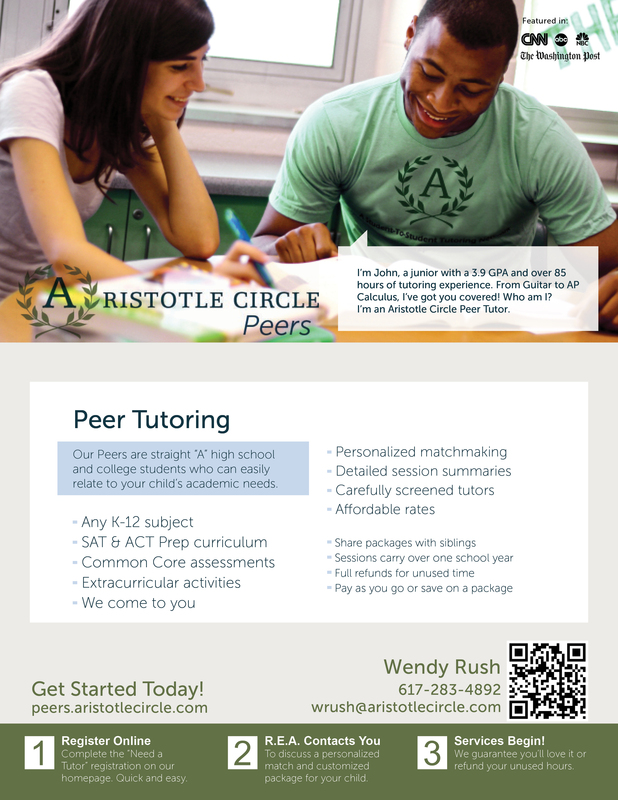 Aristotle Circle Peers has recently opened a branch in the Greater Boston Area and has started building a strong network of tutors! We recruit high achieving students to tutor and mentor peers of all ages in K-12 subjects. We offer 1:1 academic tutoring, test preparation, homework coaching, study skills support, and extracurricular activities including sports! Our tutors are screened, trained and are role models who come to you! We have affordable packages for each family and refund any unused hours purchased if you are not 100% satisfied. To schedule a tutor, please visit us here and complete the “Need a Tutor” registration on the homepage. Please make sure to select the Region: Boston, MA (Wellesley/South Shore/128 Corridor). Wendy Rush, Regional Education Advisor (“REA”) will contact you about the right tutor for your child. If you have any questions, please email Wendy Rush or call at 617-283-4892.